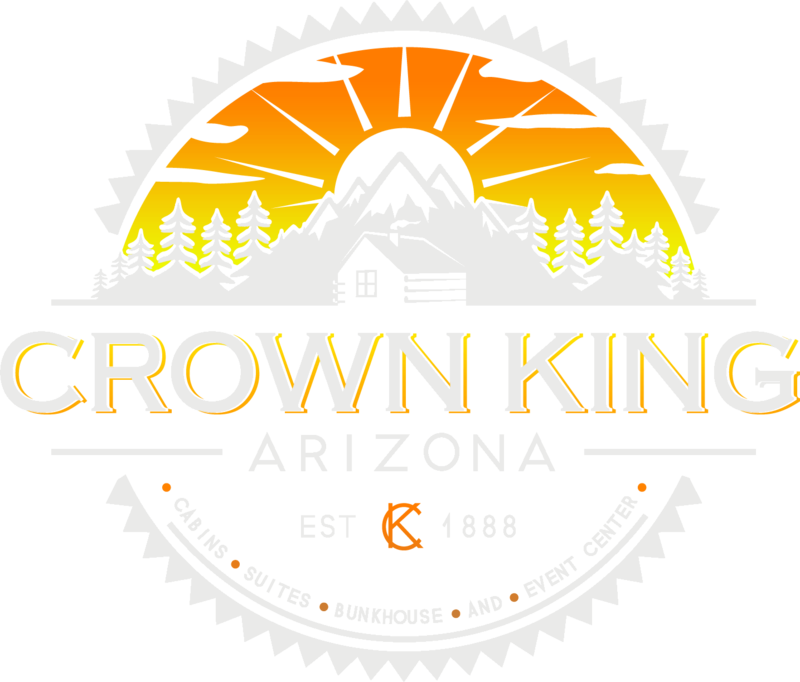 We invite you to examine a more comprehensive history of Crown King. This section page is dedicated to Bruce M. Wilson for his great contribution to the area’s history. Excerpts are presented from his book “Crown King and the Southern Bradshaws: A Complete History”. The largest mine in the Bradshaws, and the one that gave its name to the local settlement was the Crowned King Mine. 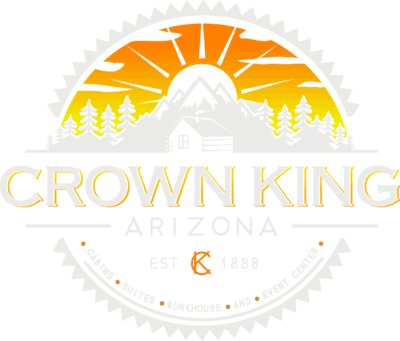 Years later, the name was shortened to its current form, Crown King. The first claim located in the Crown King group was the Buckeye, by Rod McKinnon on July 1, 1875. O. F. Place had been developing his claims in the area of the future Crowned King Mine for some years, using contracted miners. He and a man named Moody were working the Buckeye claim in 1882 with six men. Local legend maintains that the first claim in the Crowned King group was discovered by a Walnut Grove schoolteacher named John L. Taylor who traded it to Place for a saddle (or saddle horse, depending on the version). Place then gave Bradshaw City storekeeper, Noah Shekels, a half interest in the claim in payment for a debt at the store. In any case, the vein continued to show promise, and in June, 1887, Place was visited by an eastern capitalist, George P. Harrington. Harrington had originally come to Arizona to investigate placer claims on Lynx Creek for a brother of Governor N. Oakes Murphy and railroad tycoon Frank Murphy. He came back to Arizona that fall, and in November returned to his home in Edinburg, Illinois, after spending a month in the Bradshaws with Place. He was said to have developed a very high opinion of the mines in the Bradshaws. Harrington, Place and Shekels went on to form the Crowned King Mining Company on the basis of the work that Place and Shekels had done on their claims. They began filing applications for patents on mining claims in the area of the Crowned King in late 1887. Articles of Incorporation for the Crowned King Mining Company were filed in January, 1888. Shekels, as superintendent of the new mine, erected a saw mill on the site in May, 1888, and began to assemble machinery for a ten-stamp mill, which was to start operation in July. The new mill was an expansion of Luke’s original Basin Mill. A post office was established at the Crowned King in June, 1888, with George P. Harrington as the first postmaster. The mill actually began operation in August, and was said to be a very complete one. Shekels had fifty mules hauling ore from the mine to the mill, but as usual in the Bradshaws, operation of the mill was sporadic due to a scarcity of water. However, by late October rains supplied plenty of water, and the mill was running day and night. The company also erected a store at the mine site at this time. Good ore continued to show up in the mine through 1889, and by the end of that year the company was piping in water for the mill, and was also building a road to connect the mine and mill. The present Crown King road passes right next to the remains of the mill’s rock foundation about a half mile before reaching the Crown King store. The early town of Crown King began to spring up along the road connecting the mine to the mill. Not surprisingly, one of the first business ventures was a saloon, operated by Ike Patrick, the same man who had been running the hoist at the Tiger in 1879 when the bucket dropped, killing and injuring several miners. Place applied for an injunction to restrain Sheriff “Bucky” O’Neill from issuing Patrick a license, because the establishment was proving to be too great a temptation for the men packing ore from the mine to the mill. A temporary injunction was issued, and the case was considered important because, if the injunction were sustained, it would allow prohibition without legislation. Obviously, Place was not successful, since the road from the mine to the mill became the site for many such drinking establishments. In February 1890, the tremendous storm that washed away the Walnut Grove dam, causing one the greatest disasters in Arizona history, also had an effect in Crown King. High water washed away $20,000 to $30,000 worth of concentrates, and damaged the mill enough that the boilers had to be reset. The Crowned King mill continued to pound away at ore from the mine through 1890, at one point making three tons of highgrade concentrates per day. A wagon road was completed between the mine and Minnehaha Flat by way of the Tiger Mine, but bad roads continued to plague the mining operations in the southern Bradshaws. The PrescottWeekly Journal-Miner of January 7, 1891, called for a railroad to be built into the mountains to allow the mines to operate for the entire year. After the usual scarcity of water closed the mill down for the first few months of 1892, the mine and mill reopened with a vengeance in April of that year when a 300-foot deep shaft was begun, a new assay office and other buildings were built, and the cyanide process was inaugurated in the mill. In the cyanide process, the ore was crushed to the size of a pea, and then put into a tank of cyanide solution where it was left standing for twelve hours. The solution was then pumped into a high tank, and then leached through a box of zinc shavings which cleaned the metal from the solution. The solution lasted a long time, and could be used over and over. It was particularly useful in areas where water was scarce. Unfortunately, as in the case of the Peck Mine, disagreements developed between the original developers of the mine. This time between George Harrington and Noah Shekels on one side, and Orrin F. Place on the other. Place had been the actual working superintendent of the mine and mill, while Harrington continued his banking business in Illinois. Harrington and Shekels believed that Place was not running the operation properly, and took over management of the mine. Place then began litigation to regain control. When it was announced that the Crowned King Company would hold its stockholders’ meeting in Edinburg, Illinois, Place made an announcement in the Prescott paper that the meeting at which Rueben Wilkinson, R. H. Hetherington and George Harrington were elected directors, was not legal, and that acts and elections at the meeting were not valid. The notice was signed, “Orrin F. Place, President and Manager, Crowned King Mining Company”. In January 1893, the Crowned King was closed down by litigation. It was not opened again until October 1893, and then with just a small force of men. Finally, in January of 1894, the mine was again operating with a full crew. The panic of 1893 caused George Harrington to close down his Illinois bank, and move his family to Crown King in 1894. He eventually paid off all depositors from his mine earnings. The bad blood between Harrington and Place finally erupted into violence during the company’s stockholders’ meeting in Taylorsville, Illinois. Place became abusive toward Harrington and his attorney, James Taylor. Place tried to pick up his valise, which contained a revolver, but was restrained by Taylor. Place struck Taylor on the head with his cane, and then pulled out his revolver and attempted to shoot Harrington. Bystanders struggled with Place and managed to prevent him from using the revolver. Meanwhile, the mine operated successfully through 1894, and a half million dollar body of ore was discovered on the lower tunnel. The new town below the mine continued to grow, and Ed Gobin, formally of Alexandra and the Lane and Tuscumbia mines built a store at the town site. By early 1895, there were fifty men working at the mine. Another large body of ore was discovered in October, 1895, and by that time the mill had run constantly for almost a year, working thirty tons of ore per day. A constant supply of water was piped to the mill from the mine. The mine was turning out $40,000 to $50,000 worth of ore per month, and there were plans to add a new boiler and electric dynamo to supply light to the mine and mill. By July of 1896, the mine’s light plan was in operation. In mid 1896, the mine reduced its working force while sinking a deeper shaft, and establishing a station at the 400 foot level. They also built a boarding house, and improved the road from the mine to the mill. By November, the shaft was completed to the 500 foot level, and the mill was started up for the winter’s run. 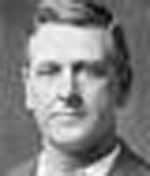 By this time the area was populous enough to have its own deputy sheriff, and in January, 1897, Jack Nelson, was reappointed as the resident deputy under Sheriff George Ruffner. Nelson was married to Essie Harrington, one of George Harrington’s daughters. Many of Jack Nelson descendants still live in Crown King. During the fall rainy season of 1897, an incident occurred that was to create one of the many lost treasure stories that endure in Arizona history. George Harrington was on the first leg of a visit to the east, was being driven in a buckboard to Prescott by experienced freighter J.P. Bruce. 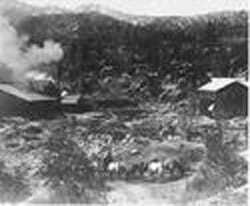 The buckboard also contained $5,000 in bullion from the Crown King Mine. They had crossed the rain-swollen Wolf Creek, about six miles from Mayer, and were climbing the far bank when one of the horses balked. The buckboard slipped back into the water and overturned. Harrington managed to save himself by grabbing a tree branch, but Bruce and the horses were caught in the flood. Unable to find Bruce, Harrington walked to Mayer and phoned to Prescott for help. A search party was sent out and Bruce’s body was found about a half mile below the crossing at 1am the next morning. The bullion was never found, even though it was searched for extensively after Place accused Harrington of killing Bruce and stealing the gold. By late 1897, Crowned King Mine had a post office, a company store, several saloons, two Chinese restaurants, and a feed yard. The town lined the stage road that ran from the mine to the mill. The light plant at the mine kept the mill, mine, and town lit all night. In 1898, the Prescott & Eastern Railroad ran as far as Mayer, making transportation to the mines in the southern Bradshaws that much easier. 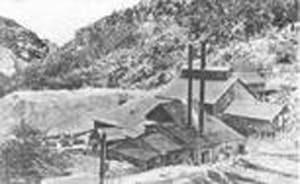 In early 1899, a strike was made at the 500 foot level at the mine which was said to be one of the richest in Arizona history. The ore was valued at $180,000 per ton. It was so valuable that it was sacked in the mine, and put directly in the company’s safe with extra guards to protect it. In spite of the Crowned King’s apparent success, the legal feud between the Place and Harrington-Shekels factions of the company had more or less continued over the years, and finally resulted in the mine being shut down in 1899. Place had originally sued Harrington and Shekels for mismanagement after they had removed him as manager. He also charged them with fraudulent issuance of stock, and holding an illegal election and meeting of the board. Harrington and Shekels argued that this could not be settled in a local court since the company was an Illinois corporation.